WELCOME to the home of Middlesex Junior Squash. On this website you’ll find all the information you’ll need about coaching, camps, tournaments, results and local news stories about junior squash in Middlesex. Middlesex is one of the largest counties by player population and has an exciting program of squash for junior players of all levels. Many of our junior players have reached reaching national statuses and rankings from starting out as juniors at local clubs. The Middlesex Junior Squash committee are keen to encourage young people to get on court as young as possible and participate in our sport. Look through the calendar of events in the ‘Calendar’ page, and find out where you can join in locally. 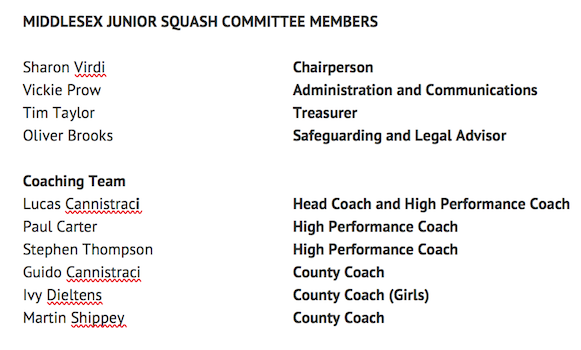 The Middlesex Junior Squash committee is a group active volunteers and parents committed to promoting and encouraging juniors into the game of Squash and Racketball across the country. Our objective is to further the growth and development of the junior game in Middlesex for players of all levels, providing an opportunity to play and participate, and create a lifelong passion for the sport. This can be achieved through training, coaching, mentoring, competitions and social events. The committee members aim support you through your junior career and can be contacted any time for support or advice via the details below.